The Iowa Senate has approved a bill that would let the major electric utilities in Iowa charge a new fee to most customers with solar panels. Republican Senator Michael Breitbach of Strawberry Point said Rural Electric Cooperatives and most city-owned utilities charge solar customers a fee for access to power lines. 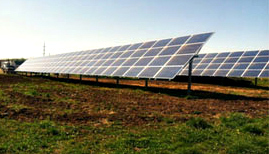 Senator Bill Dotzler, a Democrat from Waterloo, disputed the assertion solar customers are a drain on the power grid. The bill passed by the Senate does exempt plants producing renewable fuels from the new fee if solar panels are installed on those facilities. Democrats like Senator Joe Bolkcom of Iowa City unsuccessfully argued farming operations should be exempt, too. “If the biofuels facilities who are enormous energy users got let out of this bill, why can’t small farmers who want to raise hogs and dry grain get the same advantage?” Bolkcom asked. Bill backers say exempting farm operations would be financially worse for farmers compared to the three fee options outlined in the bill, plus Breitbach said there’s a cost to the utility handling excess solar power sent back onto the grid. “This bill recognizes that solar people use the infrastructure that everyone else uses to distribute electricity,” Breitbach said. The bill passed with the support of all but three Republicans in the senate. Similar legislation is eligible for debate in the Iowa House.